Yes, children with physical challenges can enjoy physical activity! There's no question that for children with physical disabilities, sports participation can be a challenge. Kids may have limited mobility and/or tire more easily than their non-disabled peers. They may need special equipment or other assistance (such as specially trained coaches, teachers, or guides) to participate in exercise and sports. Combine these with other obstacles, like the effect of medications, or sensory issues surrounding foods, and you have a high risk for obesity. AbilityPath.org, an online special needs community, analyzed data from the National Health and Nutrition Examination Survey (NHANES) and found that 80% of children with functional limitations on physical activity were either overweight or obese. Still, given the right help, children with physical disabilities can participate in almost any sport or exercise: basketball, dance, skiing, swimming and so much more. Dedicated parents, physical therapists, teachers, and community members, not to mention kids and adults with disabilities have created many sports programs for kids with special needs or worked to make sure they can be included in programs designed for children without physical challenges. It's a matter of creativity, understanding, and advocacy. Joann Ferrara, a pediatric physical therapist, founded Dancing Dreams, a ballet program for kids with physical and medical challenges in 2002 in New York. "Our program has some therapeutic benefit, but the bottom line is it's fun," she says. Besides being fun to play, sports can give both kids and parents an emotional boost. "I think sports are especially important for Max: The more his muscles move, the better," explained Ellen Seidman in a post on Love That Max, her blog about raising son Max, who has cerebral palsy, and his sister and brother. She added: "Sports can give his ego a workout, too ... I want him to feel proud of his accomplishments on the field, around other kids and parents. I want him to have that sports high." The first step: Ask around! Talk with other parents and check with your child's doctors, teachers, and therapists. They're often aware of available programs. See the list of resources below, too. Then do a little investigating to determine if the program is right for your child. 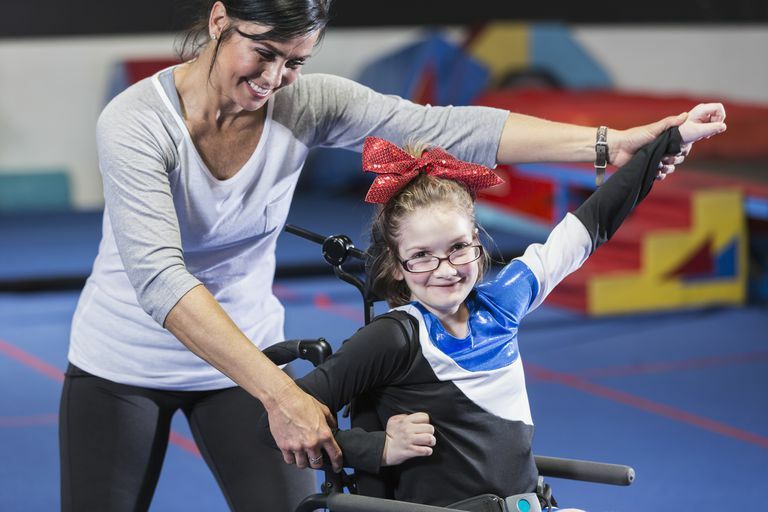 "Check out who's teaching the program (not just the director, but instructors or coaches too) and find out their qualifications specific to working with a child with a disability," says Joann Ferrara. "If your child has seizures or a trach, for example, make sure the teacher has some kind of medical training." The program should also be individualized, says Ferrara. "Every child has different needs. In my program, every move is adapted individually for each particular child. Everybody pliés; they just plié in their own way." Once you've found a program, try it out. It may or may not work for your child (the same goes for every child!). Your child may need to watch from the sidelines for a while before she's comfortable joining in, and that's fine. Some programs pair up kid participants with a teen helper, which can be very motivating. These adaptive sports programs and leagues are designed especially for children with special needs. Two more really helpful resources: The National Center for Physical Activity and Disability, which has a searchable listing of hundreds of adaptive sports programs and camps (tennis, fishing, SCUBA and lots more); and PE Central, a resource for physical education teachers, which has a handy collection of suggested adaptations for sports and activities.